Northrop Grumman has unveiled its vertical-launch, horizontal-landing reusable booster design for the Defense Advanced Research Project Agency’s (DARPA) XS-1 experimental spaceplane program. Northrop, teamed with subsidiary Scaled Composites and Virgin Galactic, is working under a 13-month, $3.9 million Phase 1 preliminary-design contract, awarded in July. Contracts also went to Boeing with Blue Origin, and Masten Space Systems with XCOR Aerospace. Northrop’s unmanned spaceplane is launched vertically from a transporter/erector/launcher, in a “clean pad”-operation with minimum infrastructure and ground crew. 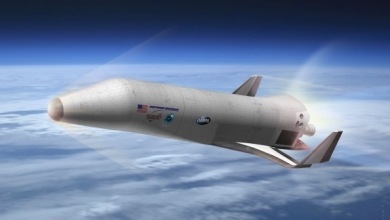 The spaceplane is designed for highly autonomous flight operations, the company says. The reusable first stage would accelerate to Mach 10 or beyond and release an expendable upper stage designed to carry a 3,000-lb.-class payload into low Earth orbit, then return to a horizontal landing and recovery on a standard runway. Key goals of the XS-1 flight demonstration are to fly 10 times in 10 days, exceed Mach 10 at least once and launch a small payload into orbit. Darpa’s target is to reduce the cost of access to space for 3,000-5,000-lb. payloads to less than $5 million per flight. Under Phase 1, the three teams will evaluate the technical feasibility of the program goals, explore alternative technical approaches and assess potential suitability for near-term transition of the reusable spaceplane to military, commercial and civil users.